In Sky Kid you and/or a friend take on the role of the titular biplane-piloting birds (don’t think about it too hard) in an attempt to complete a series of 21 missions. 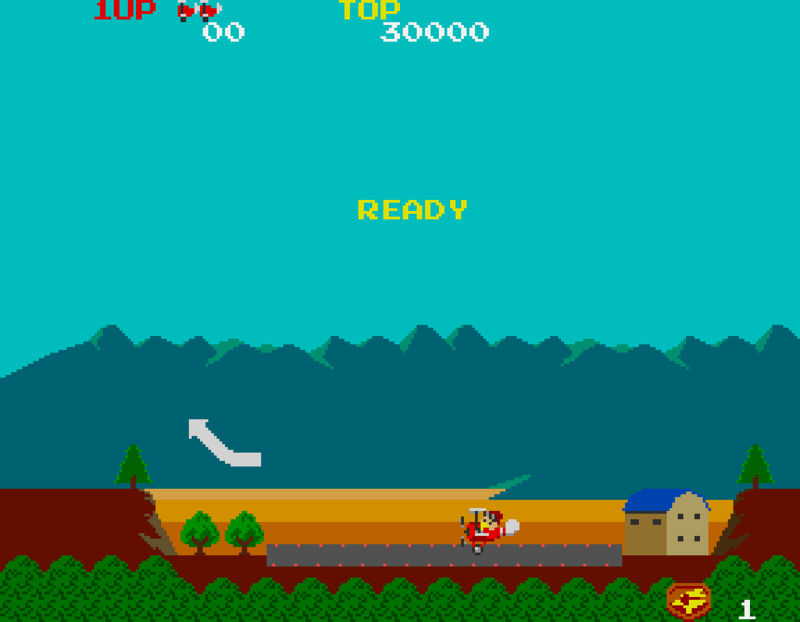 The first player is known as “Red Baron”, a reference to well-known World War I flying ace Manfred von Richthofen, while the second player is known as “Blue Max”, a reference to the informal name for the Prussian order of merit, Pour le Mérite, established in 1740 and discontinued with the end of the Prussian monarchy in 1918. 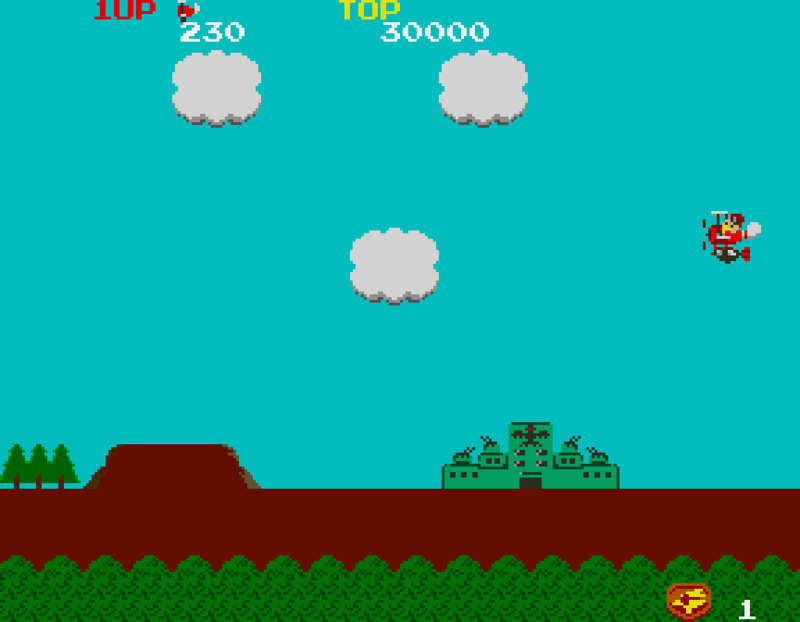 The aim in Sky Kid is, as in most games of this type, to blow up as much stuff as possible while not getting shot down. But there are a few interesting twists on the formula that mean it’s still quite an unconventional-feeling game, even today. For starters, it scrolls from right to left instead of the more conventional left to right. 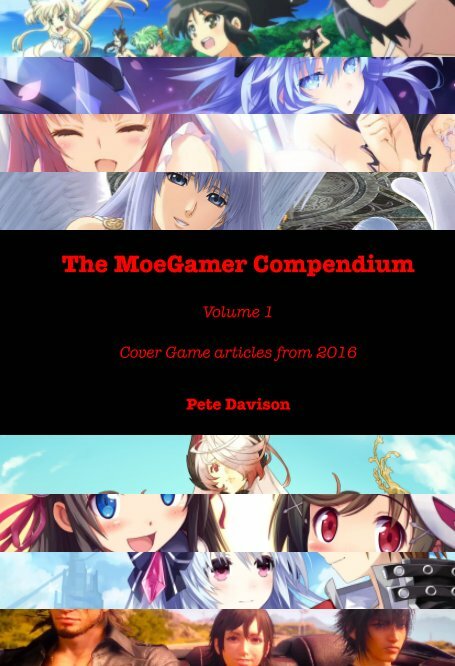 This isn’t jarring enough to be distracting, but it certainly makes the game feel immediately distinctive; indeed, it’s rare even at the time of writing to see a shoot ’em up that eschews the usual formulas of side-on left-to-right horizontal scrolling or top-down bottom-to-top vertical scrolling. Secondly, you’re relatively lightly armed. 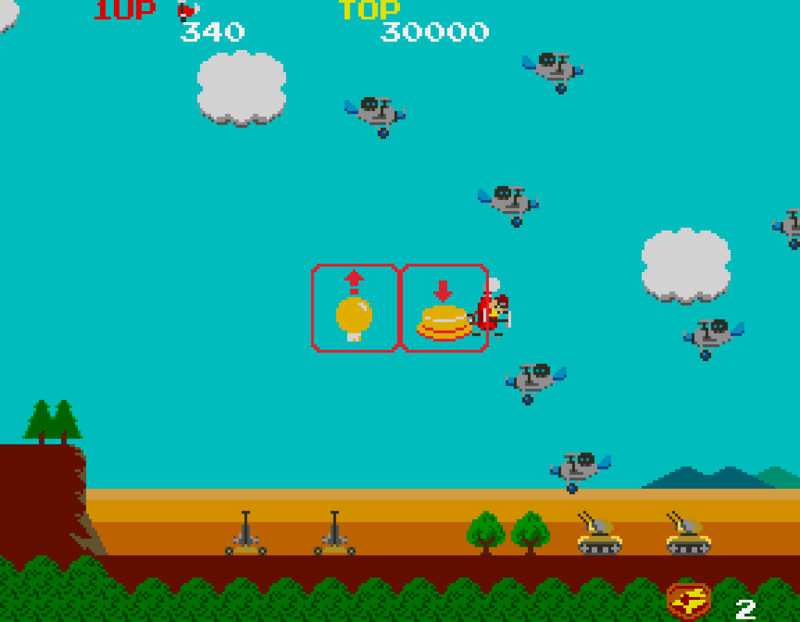 The bullets from your plane’s main gun dissipate before they travel more than about half the width of the screen, and thus you have to get fairly close to your enemies to destroy them, whether they’re ground-based targets such as trucks, tanks and artillery, or airborne targets like fighter planes, bombers or balloons. Thirdly, this isn’t a game where you simply move up and down and fire at a constant angle to one side. Rather, when you move up and down the screen, your plane’s nose raises or lowers respectively, allowing you to fire “diagonally” on the screen and thus pull off some pleasingly satisfying trick shots while avoiding enemy fire. It’s especially fun to go into a sharp dive and strafe some enemy tanks before swooping back into the sky, probably giggling as you do so. There’s also a dedicated “loop” button, which helps you both gain altitude and potentially get behind enemies coming up from behind you. Because oh yes, enemies come from all angles in this game. Fourthly, just getting hit in this game doesn’t mean immediate death… unless you crash into the ground, that is. Rather, if you get hit by a bullet or clip another plane in the sky, your plane stalls and goes into a spin; if you can recover before hitting the ground (achieved by pushing up and battering away at the fire button, just like in a real plane) you can continue on your way, no harm done. On the other hand, if you do happen to do this a bit close to the ground, you can at least take a tank or two with you if you land on them. The game’s main scoring opportunity comes from the bombing mission you’re supposed to accomplish on each level. You don’t start the level with a bomb, however, so you have to swoop down and pick it up partway through the level, then release it with the appropriate timing to hit your target when you finally reach it. Too early or too late and you’ll only damage the target; you need to hit it bang (sorry) in the middle to destroy it completely. And to make matters more difficult, if your plane goes into a spin, you’ll drop your bomb right there, so once you’ve picked it up you’ll need to fly a lot more cautiously to prevent this from happening. At the conclusion of each level, you’re awarded medals for completing the bombing mission as well as destroying significant numbers of air and/or ground targets. These bonuses are substantial, particularly in the later, longer levels, so those aiming for high scores will want to ensure their accuracy is on point and that they’re taking care of targets both on the ground and in the skies. 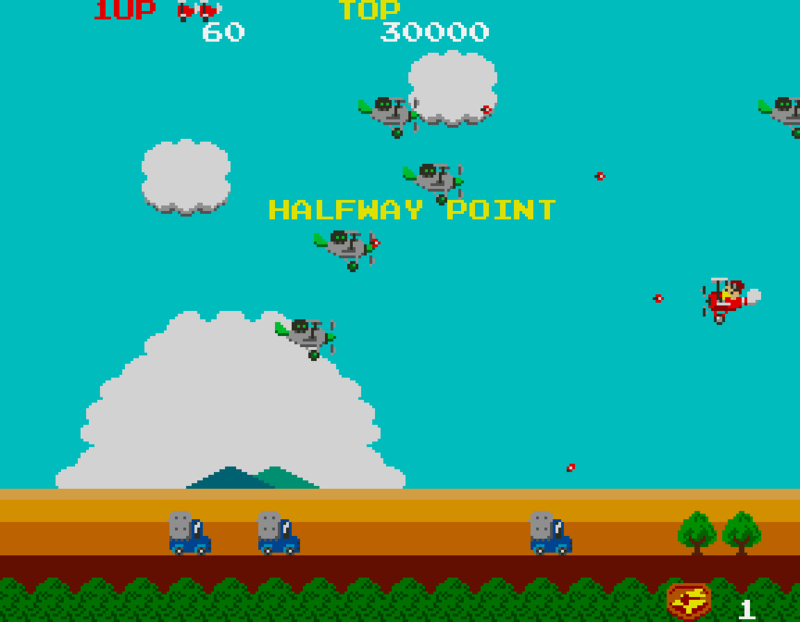 Like many of Namco’s other arcade games, you’ll find that scoring points starts out as a seemingly slow process, with that initial high score appearing to be forever out of reach, but the longer you survive, the more quickly you’re able to rack up points, tens of thousands at a time by the fourth or fifth mission. 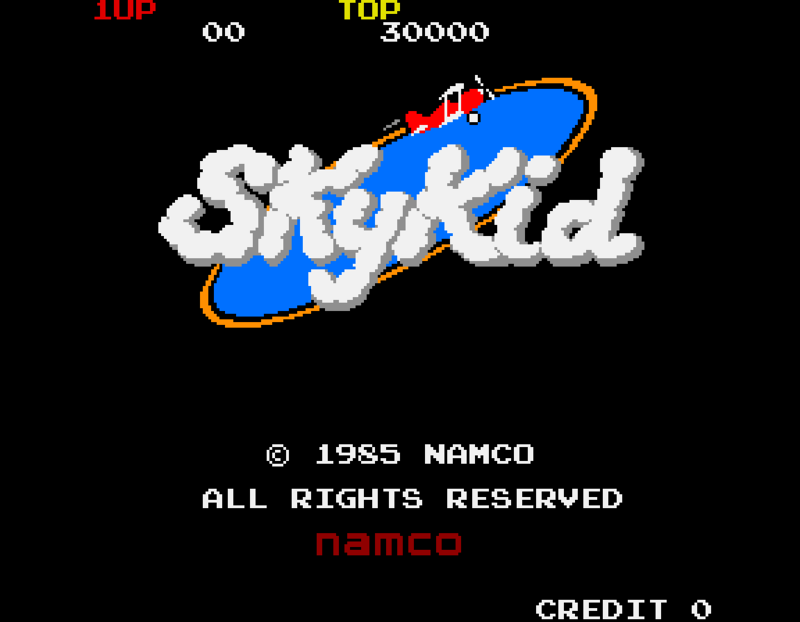 Sky Kid is an enjoyable game because it just feels so completely different to every other scrolling shoot ’em up out there, even more than thirty years after its original release. 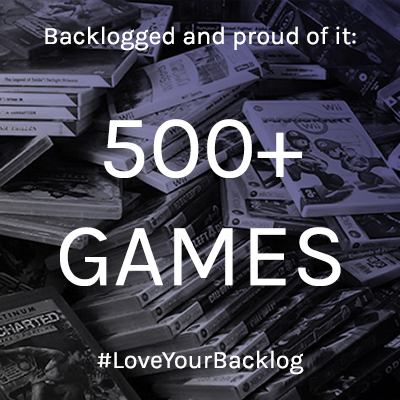 It’s very much a game where level memorisation and the fine art of judging risk versus reward play an important role in being able to progress, and like most of Namco’s other titles from the era there’s an enjoyable learning curve: initially it seems absolutely impossible, but before long you’ll notice yourself getting just a little bit better with each playthrough. And that’s how it would have kept gobbling your quarters back in the day. Thankfully all you have to do to put another “coin” in on the Switch version is hit the L button, so you can go all night if you really want to try and live up to the Sky Kids’ names. So chocks away, tally-ho and all that; it’s time to prove how much of a magnificent man (uh, bird) in your flying machine you are.